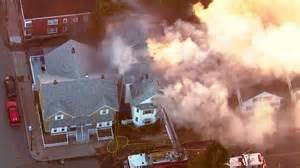 The sheer scale of a series of gas explosions which ripped through three Boston neighborhoods and killed a teenager became apparent on Friday as it emerged 8,000 people had been evacuated. Some 70 separate fires, blasts and gas odors were reported during the incident, in which 18-year-old Leonel Rondon was killed by a falling chimney. Firefighters spoke of having to race from one blaze to another as explosions leveled buildings in the neighborhoods of Andover, North Andover and Lawrence. At least 13 people were treated in hospital for injuries ranging from smoke inhalation to blast trauma. Fire chief Michael Mansfield said investigators suspected “over-pressurization of a gas main” caused the incident on Thursday. Posted in Cop Stories, Criminal Justice, In the News and tagged Boston, gas main explosions, mass disaster event, terrorism. Bookmark the permalink.